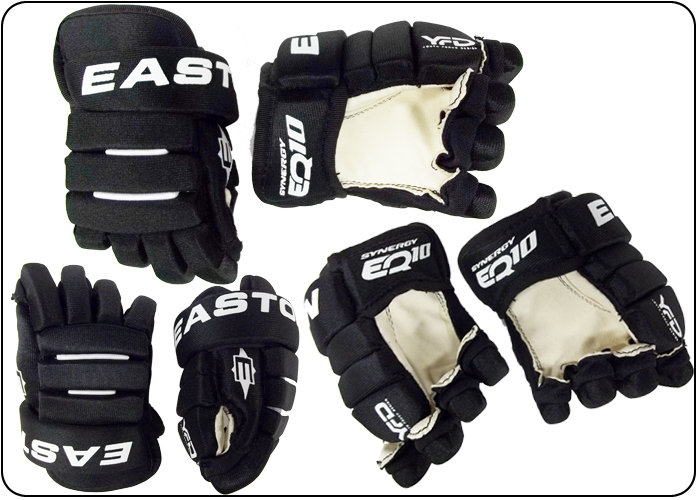 Our Hockey Gloves are manufactured by Easton . You will be impressed with the quality and how they look and feel, just like the real thing. These Hockey Gloves are a (Smaller 8” Inch or 20cm Centimeter Hockey Glove). These Hockey Gloves are light weight and require no break in at all - they are great for our little skaters! Feature special padding throughout to protect against bumps and to help keep hands warm. Color is Black and White. Hockey Glove Details… Youth Focus Design (YFD) Thumb improves comfort and the ability to pick a stick up off the ice without the need to remove the glove. Comfortable leather palm. Lightweight glove is fully covered in high abrasion resistance polyester.